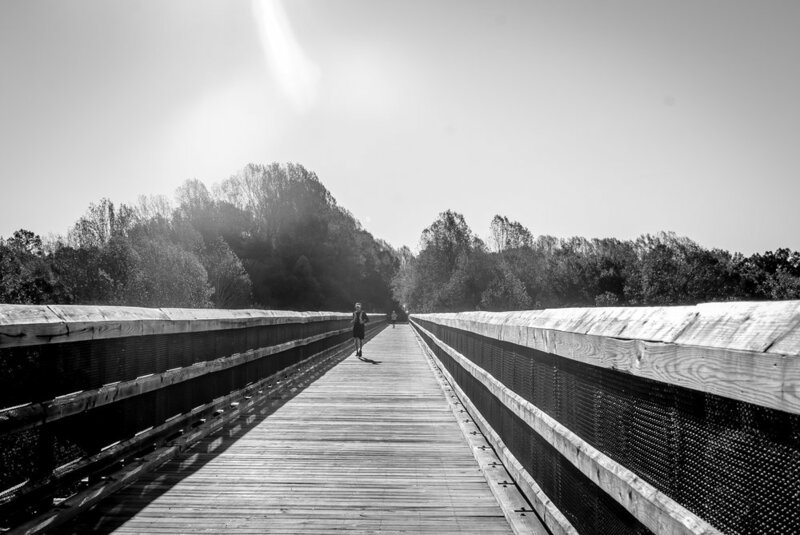 The High Bridge Trail is 31 miles long and runs through the towns of Burkeville, Farmville, Pamplin City, Prospect, and Rice. Its flat and fast, this former railroad bed its made for running! Along the way runners will pass through forests in full fall colors, over streams and creeks and across the famous High Bridge, for which the trail is named! 30k runners may miss out on the spectacular view of the High Bridge, but you will be able to get in some fun easy miles! The 30K will start in Farmville's town center at Aid Station 3 on the 50k course and follow the same course of the 50k. Packet Pick-up will be at the Depot in Pamplin, VA, Friday, October 12th from 4:00pm - 7:00pm and again on Saturday morning, 6:15am-6:45am at the depot. You may register day of with cash/check only. 50K: Runners will park in Pamplin City at Pamplin Depot, 115 Main Street, Pamplin, Va, (Phone:(434) 248-5084) and be bused to the start near Burkeville, Virginia (Orchard Lane, Rt 607). The race will start on the Burkeville side and will race to the finish at the pamplin depot in Pamplin, Virginia (see maps below). Bus leaves Pamplin @ 7am sharp. 30K: Runners will park in Pamplin City at Pamplin Depot, 115 Main Street, Pamplin, Va and will be bused to the start in Farmville. The bus will be leaving at 8:15am/8:30am. There is not much more to say beyond its a flat old railroad bed, with beautiful views! The first 30 miles will not be marked, because you will be on a well maintained and defined state trail. Once the trail ends at 30 miles, we will have cones, road paint, and flaggers to guide you through the last mile on small back roads. The course is mostly packed gravel, some runners prefer to wear gaiters shoe coverings to prevent the annoying little pebbles from getting into their shoes. The only cut off in the event is reaching Aid Station 4 (~19 miles) by 6 hours. 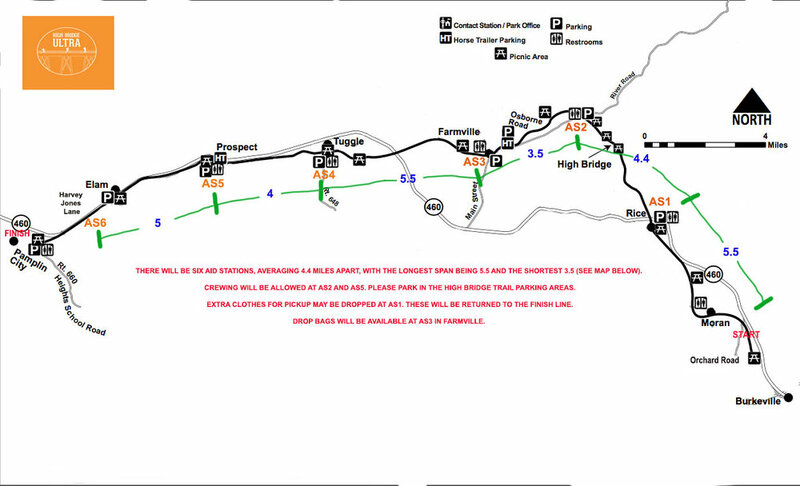 There will be six Aid Stations, averaging 4.4 miles apart, with the longest span being 5.5 and the shortest 3.5 (See map below). Crewing will be allowed at AS2 and AS5. Please park in the High Bridge Trail Parking areas. Drop Bags will be available at AS3 in Farmville. Plan for typical race foods at aid stations. Extra clothes for pickup may be dropped at start and AS1. These will be returned to the finish line. New! High Bridge Ultra went cupless in 2018! In an effort to be more sustainable and be friendly towards the environment, the High Bridge Ultra is now a cupless race. All runners will need to carry their own reusable cup throughout the race to use at aid stations. If you do not have one already, you have the option to purchase one of our TrailAdventure cups when registering and it will be waiting for you at packet pick-up.